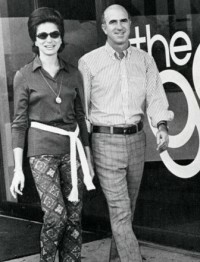 Doris and Don Fisher opened the first Gap store in Ocean Avenue, San Francisco in 1969. The locale, in order to make it "easier to find a pair of jeans," also sold records and tapes. Today Gap is one of world's largest specialty retailers, earning a reported $ 15.9 billion in fiscal year 2006. The headquarters of the apparel giant is still located in the Bay Area but its product design offices are scattered through New York City, San Francisco and London. Gap owns 3,191 shops around the world, even thoguh it distributes its products only in the U.S., Canada, the United Kingdom, France, Ireland and Japan. In our comsumption-based world, in which it is the norm for a product to be made in one country with fabric from another country, and then shipped to a third for sale, the impact of the apparel trade industry is global. The choice of the manufacturing countries is critical. The cost of the labor depends the margin made at the end of the process. The ever-intensifying price competition drives factories to produce more clothing for less money. Consequently, the frontier between a low-cost factory and a sweatshop is thin and Gap has long been accused of downplaying violations of workers' rights overseas in favor of larger profits. Labor abuses are widely considered a chronic problem in the global apparel industry. Nonetheless, Gap firmly states that physical abuse and "psychological coercion" are relatively rare at factories contracted to make their clothing. Gap inc has made a substancial investment in monitoring labor practices in its global supply chain. The company has carried out 8,500 visits have been performed by 90 full-time monitors in an estimated 3,000 factories in 50 countries. As a result, the company revoked its stamp of approval from 136 factories after finding serious violations of minimum wage, safety, environmental or other standards, twice involving underage labor. In one case, a 10-year-old Indian boy was found to be working 16 hours a day for no pay. He had been sold to a sweatshop by his parents along with 40 other children. Gap's factories are concentrated in China, India, Bangladesh and Sri Lanka, countries that have no established minimum wage. Typical work weeks exceed 60 hours. Nevertheless, most low-level workers from thes nations can't afford to see these factories moving out of their country. It is their only means of survival for the majority of them. China, who is Gap's number one manufacturing source, producing 16 percent of all goods, doesn't recognize unions. China also has a traditional governmental inclination towards secrecy.